The SVOD platform is innovating in many fields, but what about its social media strategy? From encouraging binge-watching to its innovative recommendation tools, Netflix is unquestionably changing the way audiences consume content. But what about the platform’s social media strategy? – engaging them via a variety of user generated content (UGC) campaigns. 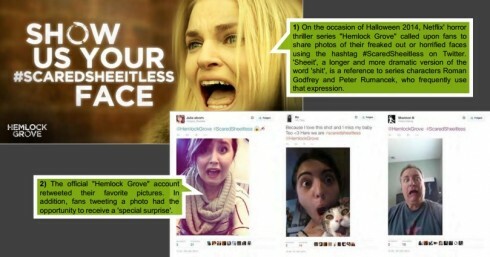 An important part of this strategy is Netflix’s #StreamTeam: family bloggers around the world who promote the platform’s content via blogposts, social media activity and various special operations, from real life gifs to student ambassadors and from interactive Instagram maps to horrified faces competitions (for Netflix’s original show Hemlock Grove, see the below example from VAST MEDIA’s white paper). Click here to find out and discover more exclusive data in this exclusive white paper from VAST MEDIA! VAST MEDIA tracks and benchmarks interactive and multiplatform initiatives of broadcasters and producers worldwide. Check out all of their MIPBlog posts here! And be sure to follow VAST MEDIA on Twitter for more updates.